Takei spent his childhood in an internment camp. 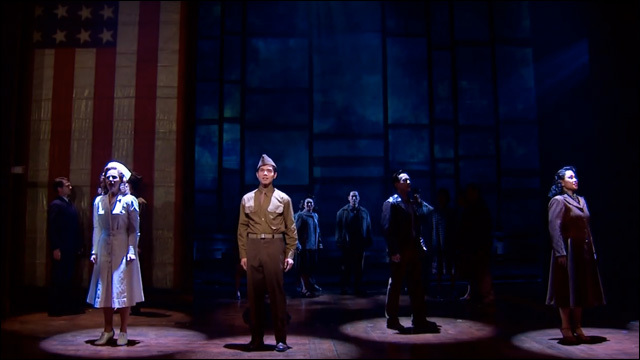 Allegiance, inspired by his true-life experience, tells the story of one Japanese American family's resilience as they are wrongfully imprisoned during World War II. History is repeating itself. There are obvious parallels between the wartime incarceration of 120,000 loyal American citizens and the dangerous contemporary climate of Islamophobia. And Trump clearly has no problem recklessly poking at the hornet's nest for political gain. Will Trump Face The Music? I invited Donald Trump to see our show to see if I could make his heart grow three sizes, but haven’t heard back. So I arranged something extra special for him. Have a listen, friends. You hear that, Trump? There is literally a seat with your name on it at the Longacre Theatre. 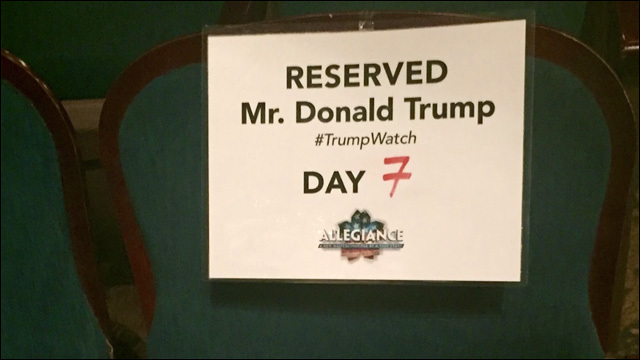 As of this writing, Allegiance is on Day 11 of #trumpwatch.